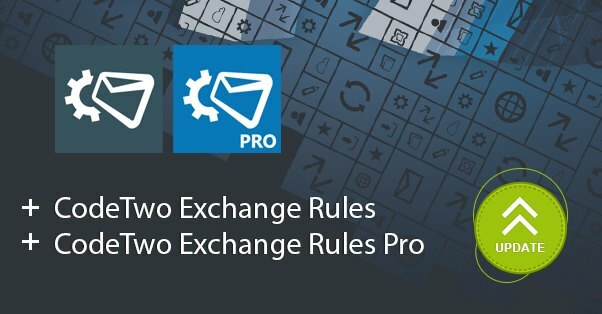 We’ve just released an update to CodeTwo Exchange Rules 2016, 2013, 2010, 2007 and CodeTwo Exchange Rules Pro – our email signature (and, in the case of CodeTwo Exchange Rules Pro, email content and flow) management applications for Microsoft Exchange. The update brings several major improvements in areas such as remote configuration of email rules, management of access rights to rules and rule edition auditing, as well as minor fixes. Detailed lists of changes are available on respective version history pages (see links at the bottom of this article). In the old days, every time a non-IT department wanted to deploy a company-wide email signature policy, set a professional ‘we have received your email’ auto-response, or reroute selected incoming emails to a shared mailbox, they had to reach out to the IT administrator. This often lead to a minor tweak becoming a cross-departmental project with lengthy email exchanges, research, explaining, negotiations, etc. Needless to say, it wasted a lot of time and resources. New versions of CodeTwo Exchange Rules and CodeTwo Exchange Rules Pro fix this problem. The applications now allow administrators to securely delegate email management duties to other staff on various levels of granularity and breadth. For example: one user may receive rights to only edit existing email signature templates, another to also modify conditions and exceptions of email signature rules, their manager can be granted broader permissions enabling him or her to also create and delete rules, and so on. 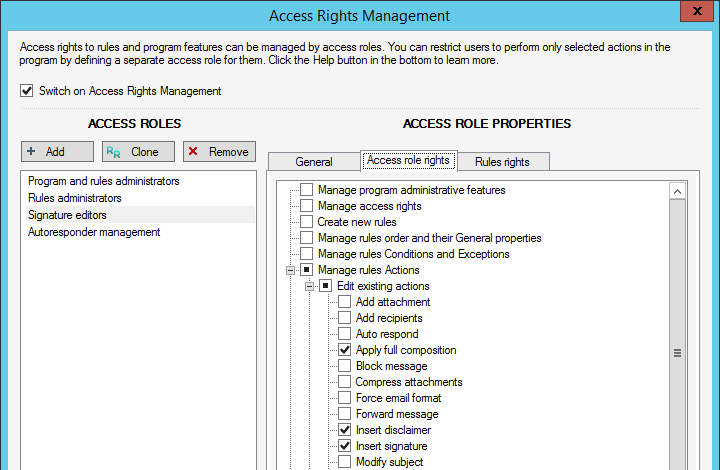 The rights assignment model is based on roles, which can include AD users, AD groups and password-protected External user accounts. All the end user has to do is run the program’s Administration Panel on their machine. Managing email signatures, and other aspects of email content and flow using CodeTwo Exchange Rules can now become a more collaborative effort than ever. The applications now display information about who created and last modified a rule, using which access role and when it happened. Rules can be tagged with annotated color categories. Bulk selection lets users perform actions on multiple rules simultaneously. Dragging and dropping items on the list of rules is now possible. To simplify rule discovery, the Search filter feature has been introduced. New versions of CodeTwo Exchange Rules and CodeTwo Exchange Rules Pro are available for download on our website. New users can trial our products for 30 days at not cost to see how they perform live. If you have any questions about the new versions, feel free to contact us! We are open 24h Monday through Friday.